We’re excited to announce that this week’s update to Power BI now offers work item tracking in the Visual Studio Online content pack. This update includes a new dashboard, report and an updated data set offering insights on your work items in addition to important metrics about your Git repository, pull requests, and version control content included in the initial version. 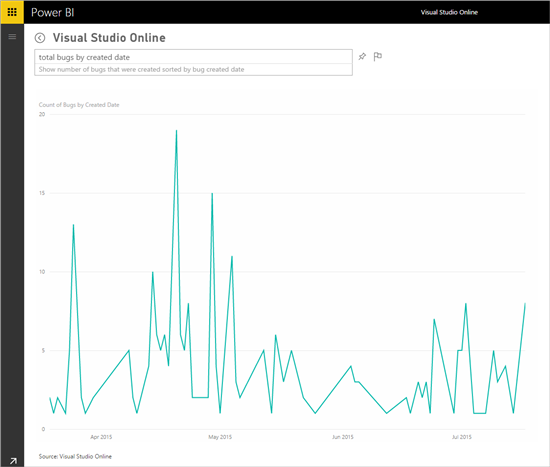 This post will detail how the Power BI content pack helps you explore your Visual Studio Online data including work items. 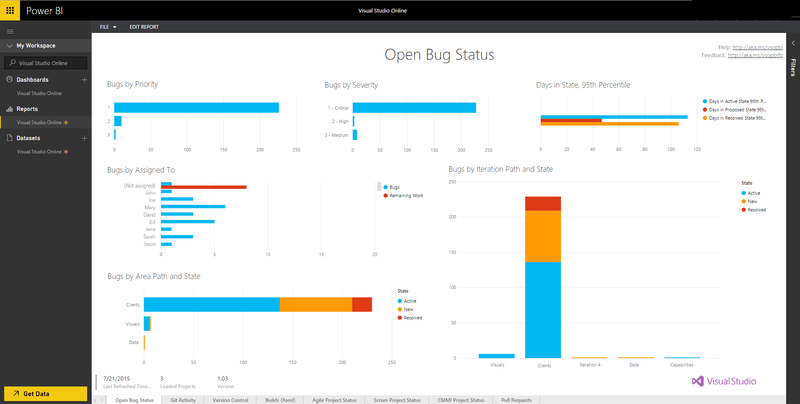 For additional details on how to get started, please see the Visual Studio Online content pack for Power BI help page. The content pack brings in data about the current state of work items, including important calculations such as remaining work and total effort, build XAML data and more. 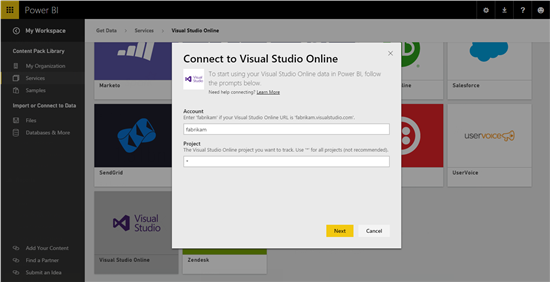 To get started, just connect to your Visual Studio Online account. A dashboard is automatically created once you’ve provided the project you want to connect to and your Visual Studio Online credentials. The dashboard contains a set of insights such as “Work Items by Type and State” or “Remaining Work by Iteration”. Selecting one of the tiles will drill in further to the reports backing your dashboard. This update includes 7 pages in the report, including Open Bug Status, Git Activity, Version Control, Builds (XAML), Agile Project Status, Scrum Project Status, CMMI Project Status and Pull request. The reports include a set of visuals with different insights. You can hover over any of the items for more details, or select a particular value to cross filter the other visuals on the page. The filter pane allows you to change the slice of data you’re viewing. The reports can be customized to ensure each page include metrics and content that is important to you. Use the navigation at the bottom of the report to move between pages and add more. Switch into Edit mode or select the dataset to explore the curated model directly. This model contains over 30 different tables with important fields and calculations that can be used to monitor your data. Find a complete list of what’s included in the “What’s Available” section in the Visual Studio Online Power BI documentation. Explore by selecting any of the fields to start creating the visuals and customize them using the Visualization pane. You can save the reports you created and any of the visuals can be pinned to the dashboard, allowing you to fully customize it for your needs. Another way to explore the data is through the question box above the dashboard. Start by asking a question of your data – such as “total bugs by created date” or “show pull request completion rate in last 30 days”. Those results can also be pinned to your dashboard by selecting the pin icon. After the initial import, the dashboard and the reports continue to update daily. You can control the refresh schedule on the dataset. Keep an eye out for future updates, we’re looking to add work item history, parent/child relationships and more. 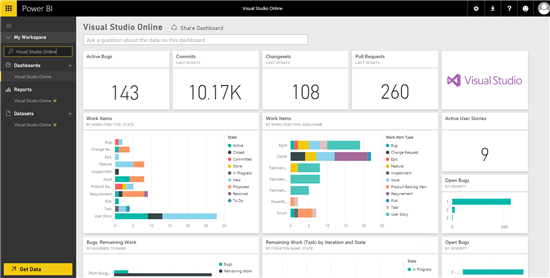 With the Visual Studio Online content pack for Power BI, you’re provided with an initial set of metrics and insights allowing you to explore your data even further.